Bid goodbye to chemical laden perfumes with the TreeWear Natural Deodorant. 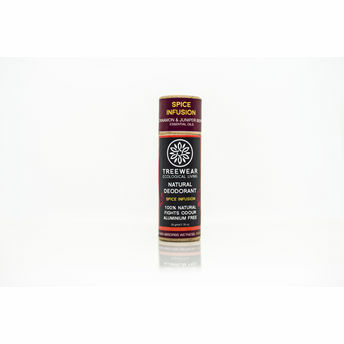 This deodorant has warm and crisp notes from cinnamon and juniper berry which have been brought together in this wonderful spice infusion. It is formulated using essential oils with natural deodorizing agents which help remove harmful bacteria and provide protection against odour, while being gentle on the skin. Solutions from nature: Unlike regular deodorant, our special blends use the power of anti-bacterial essential oils and naturally occurring odour removing agents. This means no aluminum, parabens/SLS, artificial fragrances or preservatives. Giving back to nature: Each product sold contributes towards a tree in our planting projects around India. This means that your choice can make a positive difference to our planet. Better for you and the environment: These natural products minimize the negative impact on the planet and are safer, more wholesome alternatives which are cruelty-free. About the Brand: TreeWear is an eco-lifestyle brand focused on creating fair, natural and sustainable alternatives to everyday products, made to benefit you and the environment. The products are handmade, vegan and responsibly made. Each bottle that you buy from them contributes toward tree planting projects in India.